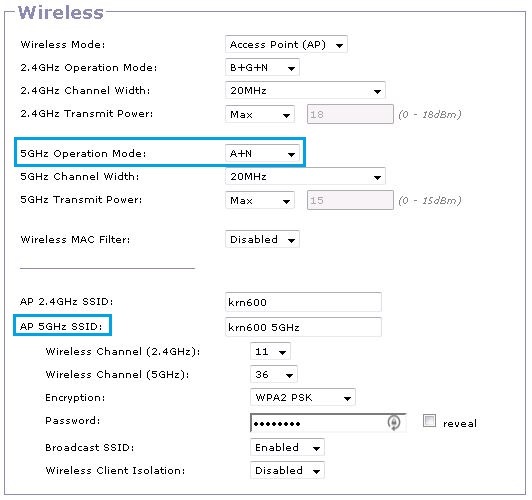 How to enable 5Ghz wifi. The Kibosh Router N600 and Archer C7 ship with 2.4Ghz wifi on by default. However they both have 5Ghz capability which can be enabled. Q: What’s the difference between 2.4G and 5G? A: 2.4G has much more range than 5G, but doesn’t carry as much data. For example, if you are downloading, or moving a large file 5G will be faster. However for most applications (streaming video, multiplayer games, etc) 2.4G works fine. You will use 2.4G most of the time due to the short range of 5G. 5G is especially great if you can put a NAS and / or gaming consoles on it. Note that 2.4G works perfectly fine, so don’t stress out if 5G doesn’t work for whatever reason. Note that some devices do not gracefully switch back and forth between the 2.4G and 5G networks (i.e. you’ll need to manually switch sometimes). So if you enable 5G, and use it, and your WiFi stops working…check your WiFi network first. Note that for your device to take advantage of the 5G speeds it needs to have a 5G aware Network Interface Card (NIC). Most newer devices have this, and most older one’s don’t. Usually if the device will not support 5G it won’t connect, or the Internet stops working. Under Wireless change 5Ghz Operation Mode to A+N for the N600’s, and A+N+AC for the Archer C7’s.